Start your full-day tour with morning pickup in Brisbane by climate-controlled minivan. Travel about one hour north to reach the legendary Australia Zoo. Disembark at the Australia Zoo and enjoy about four hours on your own. Animal handlers show animals at scheduled times, giving you the opportunity for an up-close encounter. 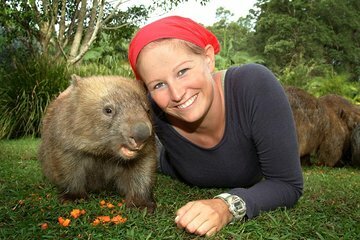 Options for other encounters include the chance to hand-feed kangaroos, pat a koala, meet Outback stars like the dingo, wombat, lemur and tortoise, and watch a Birds of Prey show. Check the zoo's daily schedule for details. Get a close look at Sumatran felines in the Tiger Temple, and see crocodiles emerge from clear water pools during the Crocoseum show. The exhibit 'Africa' features spacious plains modeled on the African Savannah, inhabited by rhinos, giraffes, cheetahs, zebras and other exotic animals. After approximately four hours, meet your guide at the designated spot and reboard your coach. Drive for 30 minutes through the Sunshine Coast Hinterland where you find beautiful mountains and a cooler climate. Visit the town of Montville, which sits at 1,310 feet (400 meters) above sea level. Stroll through streets lined with art galleries, wineries, restaurants and eye-catching architecture. Have time to browse the boutiques for handmade cheese, candy and artisan goods. Next, drive to nearby Mary Cairncross Scenic Reserve for an optional walk with your guide through the rain forest. Admire the towering trees, abundant plant life and views of the Glass House Mountains and Coral Sea. Return to your starting point in Brisbane in the early evening at the end of your 9-hour tour. AAT Kings is primarily has a transportation function for this tour. Getting from Point A to Point B is always an important factor for our tours and this one went off without a hitch. We shared the bus with several other tourist that were enjoying the same or other activities as us, and our driver Frank made sure all parties were aware of what they were doing, where they were going and what upgrades were available for them beyond what they had originally scheduled. I will be quick to state that the Australian Zoo is truly an homage to Steve Irwin. Some may see it as commercializing the man, but I didn't feel that way, rather felt that Steve was the reason I even knew about the zoo, and the main reason I was there (may he rest in peace) and so see him everywhere, really brought home the love that was felt for this gentle lost soul. The zoo itself was amazing! Clean, well organized, and all volume of creatures was breathtaking. We really enjoyed the experience. Once we were done a different transfer company picked us up and delivered us to a little town where we met back up with Frank. If you like leather products, there is a great store in town to check, they actually had stingray wallets! Never knew that to be a thing, but the quality was definitely there for all their products. Upon our completion of the town tour, we were back on the bus with Frank who continued to provide us with awesome Aussie information and wit. Totally recommend this tour,. This was the best tour ever! Our guide, John, was excellent. He was very knowledgeable and enthusiastic. He gave us great tips on what to see and where to go while at the zoo. He was very good with my children and made them feel special. Would recommend this trip to everyone! What a wonderful Zoo. Great rime. Absolutely fabulous!! John our driver and tour guide was brilliant. Shared so much local knowledge about Brisbane and also the Sunshine Coast. Australia Zoo was great and we saw lots of the animals especially the younger ones very animated due to the light sprinkling of rain. The highlight was the 16 week old tiger cub siblings and the 8 week old tiger cub and of course the young rhino. Montville was as wonderful as I remember 15 years earlier but unfortunately could have had at least another hour there. Definitely a place you need more than time in - I suggest half a day minimum. A must do tour with a very informative and helpful driver John. Not value for money. Suggest - go by public transport and buy the 59 entry at the Zoo. Had to pay extra for hotel pick up and then extra to be picked up at the Zoo to rejoin our bus which had taken others to Noosa. Bus was uncomfortable with poor visibility especially at the back of the bus due to advertising. It was a wonderful day and we really enjoyed the trip to the zoo.